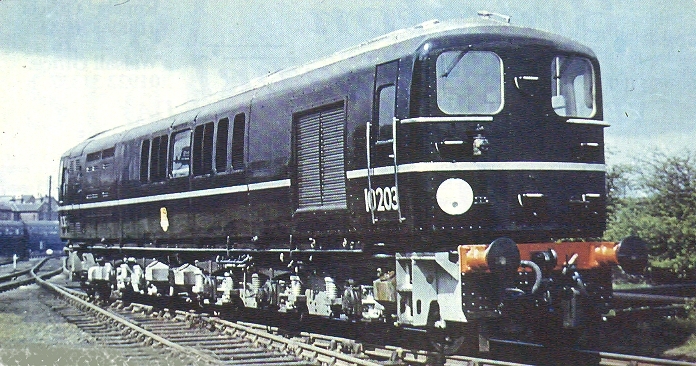 10203, its Southern Railway origins are apparent by its EMU front end look alike, this picture taken at Eastleigh works in 1954, Although an updated version of 10201, 10202 it qualifies for 'prototype' in its own right as if differed considerably. It was built at Brighton with an uprated version of the English Electric 16SVT, its higher 2000hp performance gave it a considerable advantage over its 2 earlier sisters. All three were withdrawn in 1962 and scrapped at Derby. Perversely, the 1Co-Co1 bogie design then found its way beneath Sulzer power in the ten pilot scheme Peaks, as well as EE's rival Type 4, the class 40's.